Some people love kayaking for getting close to nature and enjoying the peace and tranquillity of places others can’t reach. Others love it for the exhilaration, exercise, adventure and the adrenaline rush of navigating rocks and rapids. Whatever your reason, let us help you on your kayaking journey. Whether you’re a beginner wanting to give kayaking a try or an experienced paddler who wants to take their kayaking to the next level, we can help. We provide fun and flexible kayak instruction at all levels to get you on your way to paddling white-water. We teach at levels I, II & III, taking beginners to a calm, very slow-moving part of the river. Instruction up to 4 hours per day, depending on you! We’ll teach you until you run out of energy! Come dressed in a swimsuit or shorts and t-shirt. You will also need to bring your passport number. 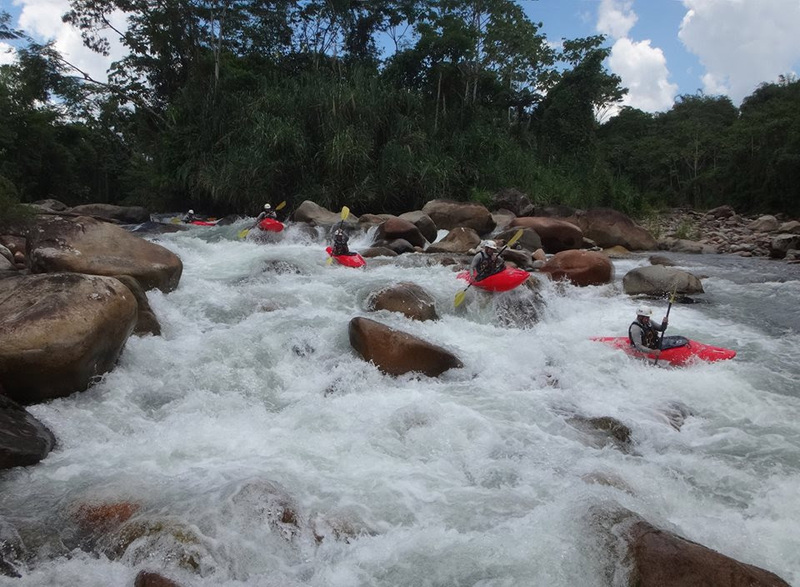 If white-water is one of the reasons you’ve come to Educador, you’ll know the rivers around Tena offer some of the most spectacular runs in the country. You can find big water, drop-pool runs as well as long stretches of continuous, technical paddling. Having grown up next to these rivers, and paddled them since we were teenagers, let us guide you down these rapids! Optional – waterproof camera or GoPro for some amazing shots! We leave at 9am from the Raft Amazonia office at Av. 15 de Noviembre y Cesar Augusto Rueda. (We can also pick you up from your hotel/hostel if you prefer). We then head out in the 4×4 to the banks of the river of your choice with the kayaks and all the equipment in the truck. Once we’re all kitted out and ready to go, we wave goodbye to our driver, push off from the bank and take to the waves! After a mornings’ kayaking we stop for a delicious lunch when your guide can tell you more about the river and the plants, animals and people who live here. After more paddling in the afternoon, as the trip ends, we pull in to the side of the river, where the 4×4 will be waiting for us. A 10-minute drive brings us back to Tena for around 3 or 4 pm.